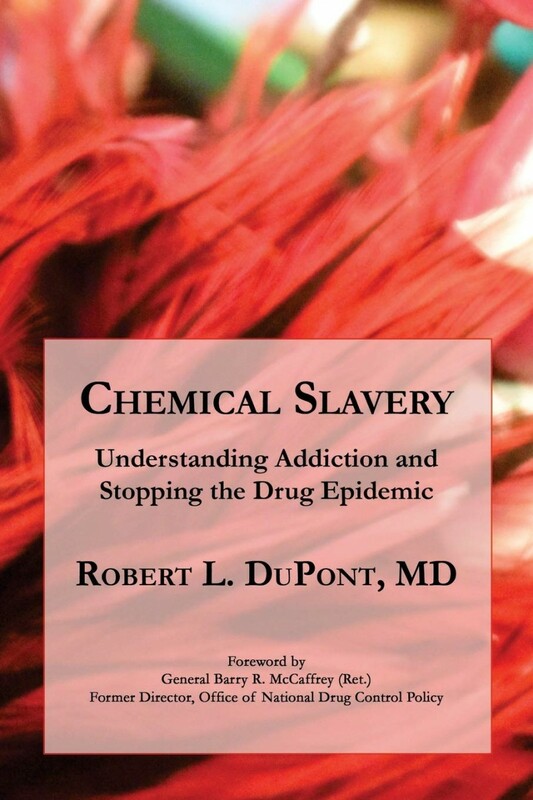 At a time when the nation is searching for ways to save lives from opioid and other drug overdoses as well as how to reduce the burden of addiction on individuals, families and communities, Robert L. DuPont, MD has written Chemical Slavery: Understanding Addiction and Stopping the Drug Epidemic, for parents, teachers, physicians and for everyone afflicted by addiction. The book also guides leaders in public policy and planning positions, as well as drug abuse treatment. 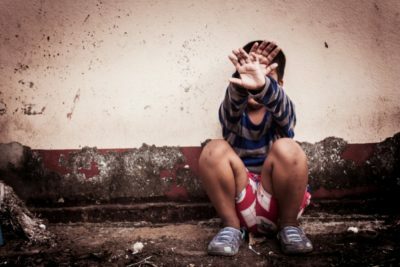 He urges widespread collaboration—the involvement of all persons involved with drug users to confront what they see—“to pull back the disaster-producing veils of denial and enabling.” Drug overdose is now the leading cause of death for Americans under the age of 50, surpassing deaths from car crashes, guns, and other diseases. The national drug epidemic is fueled by a revived opioid epidemic, easily available and less costly heroin and fentanyl, and by prescription drug abuse. These factors and the increasingly common use of ever-more potent marijuana, alcohol misuse, and synthetic psychoactive drugs have contributed to a drop in American life expectancy for two years in a row. Drug abuse is sending its victims to the nation’s emergency rooms in greater numbers than ever before. DuPont calls for a new national prevention standard, analogous to wearing seat belts and bicycle helmets, of no use of any alcohol, tobacco (nicotine), marijuana and other drugs by those under the age of 21. He shows increasing numbers of American youth have been turning away from any drug use for decades. A recent study DuPont coauthored using data from the University of Michigan’s Monitoring the Future survey showed that 26% of high school seniors reported never having used any alcohol, cigarettes, marijuana, or other drugs in their lives in 2014, as compared to only 3% who reported never using any drug in 1982.4 He cites the success of Sweden, where a framework of discouraging recreational drug use developed over several decades and a criminal justice system promoting treatment has resulted in low levels of youthful drug use and low levels of incarceration. In clear easy to understand language Chemical Slavery reviews the personal, genetic, and risk factors for addiction and the biological impact of drugs on the brain. DuPont integrates this science with cultural factors and history to show the forces that are driving the opioid epidemic. He identifies young people who heavily use opioids, marijuana, alcohol, and cigarettes in their adolescence as being at particularly high-risk of addiction to opioids and other drugs throughout their lives. According to a study done by the Center on Addiction at Columbia University, 90% of addicted people began their substance use before the age of 18. DuPont asks families and communities to sharply reduce youthful drug use by de-normalizing today’s recreational pharmacology. He recommends using social disapproval similar to the public health strategy increasingly used with cigarettes. DuPont calls attention to two major features of drug addiction: first, the continued use of drugs despite repeated, serious problems caused by that use and second, dishonesty. The book explains why you cannot be an honest addict. Within the treatment community, he bridges the conflict between types of treatments for addiction that use and that do not use medications. Instead he focuses on the central treatment goal of sustained recovery with a pioneering recommendation of no nonmedical drug use and significant improvement in social functioning over a period of five years. DuPont refers to Alcoholics Anonymous, created in Akron, Ohio in 1935, as an American miracle, one of the nation’s great contributions to the world. This remarkable, rapidly growing global fellowship was created and continues to be run entirely by alcoholics and drug addicts dedicated to ending the chemical slavery of millions of addicted people. This culture of recovery can count among its members more than twenty-five million Americans who have overcome serious drug and alcohol problems. He advocates the integration of Alcohol Anonymous and Narcotics Anonymous and other community-based recovery support into addiction treatment programs along with appropriate use of medications, family support and comprehensive life-long health care. Persuade all elements of the health care system to identify and treat addiction as a serious chronic disease and to monitor recovery for a patient’s lifetime like other serious disorders, such as diabetes and high blood pressure. Embrace a clear youth prevention goal of “One Choice: no use of alcohol, tobacco (nicotine), and marijuana or other drugs before the age of 21 for reasons of health.” Reducing future rates of adult addiction must begin with youth prevention, when the brain is undergoing rapid development and is uniquely vulnerable to drug use. Establish long-term recovery as the goal of all addiction treatment. Educate physicians on the risks of prescribed controlled substances and how to handle addiction as a treatable disorder while respecting the people suffering from substance use disorders. Take strong criminal justice system action not only to prosecute drug sellers but also to serve as an engine of recovery by providing monitored treatment of those on parole and probation who have substance use disorders. Mobilize the families living with addiction to intervene and support their loved ones throughout the process of treatment and recovery. This includes long-term monitoring to both prevent relapse to substance use and when relapse occurs to initiate prompt intervention. Conceptualize a drug-free life within the context of other healthy living initiatives such as diet, exercise, and the use of seat belts. Conduct research and gather data to evaluate strategies to control and contain the drug epidemic. 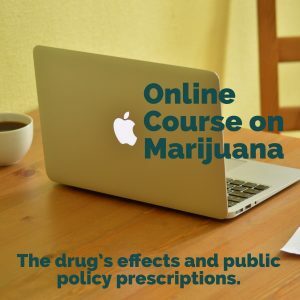 The recent upgrade of the engagement of the Office of the Surgeon General, the National Institutes of Health and the US Centers for Disease Control and Prevention on drug use and addiction is encouraging. Countering the prevailing view that this is a hopeless problem or someone else’s problem, DuPont expresses optimism for the nation’s future, “Addiction is a hopeful problem, and it’s everyone’s problem.” Recovery from addiction is more than going back to the way one was before addiction. Recovery is a better self that is enhanced by the challenging work of emancipation from chemical slavery. In the same way, families that deal successfully with addiction are enhanced by their struggles. In DuPont’s view society as a whole stands to be better for the hard and sustained hard work necessary to overcome the current deadly drug epidemic. DuPont is a graduate of Emory University and the Harvard Medical School; he completed psychiatric training at Harvard and the National Institutes of Health. After taking a position in research with the Washington, DC Department of Corrections, he was asked by the city’s Mayor to help turn back the heroin epidemic that was then crippling the nation’s capital. In response he founded and led the community-changing Narcotics Treatment Administration. He then served as the Director of the White House Special Action Office on Drug Abuse Prevention and subsequently became the first Director of the National Institute on Drug Abuse. DuPont left government service to found a non-profit drug policy and research organization, the Institute for Behavior and Health. He is a Clinical Professor of Psychiatry at the Georgetown University School of Medicine. His name is on 15 published books and monographs – including The Selfish Brain: Learning from Addiction—as well as on 400 professional articles, book chapters and papers. 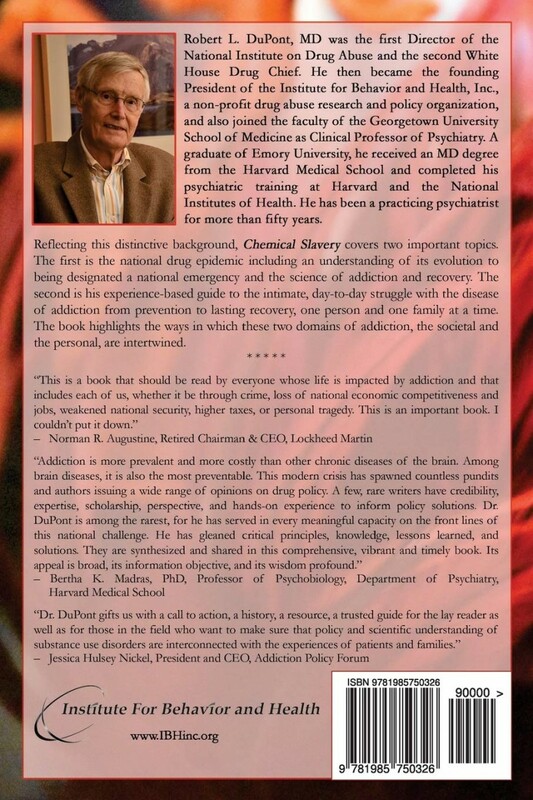 In addition to his policy and research contributions, DuPont is a practicing psychiatrist and notes that his patients have been his best teachers about addiction and recovery. He has devoted his career to understanding the nature of drug addiction, setting it in its proper scientific and social context, and developing nationally recognized innovative strategies to overcome addiction and to promote recovery. He reminds us that life free of chemical slavery is characterized by “stability, serenity, and ability to enjoy natural pleasures” and the competence to deal drug-free with the difficulties that are part of life. 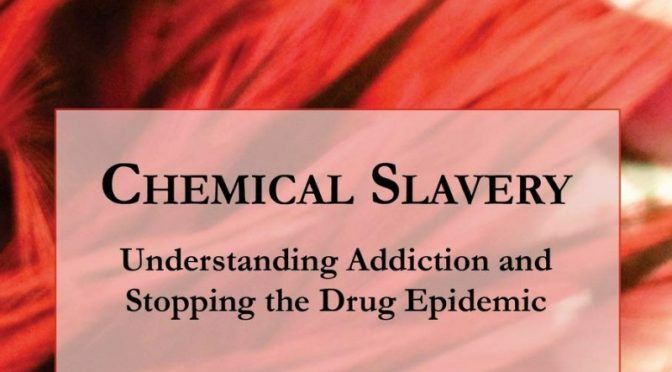 Published by the Institute for Behavior and Health, Inc., Chemical Slavery, 269 pp., is available through Amazon at $14.95. This important book will help parents, recovery professionals and politicians.